Individual Artists of Oklahoma (IAO) has given Oklahoma visual artists, poets, musicians and other creatives a venue for sharing their work since 1979. 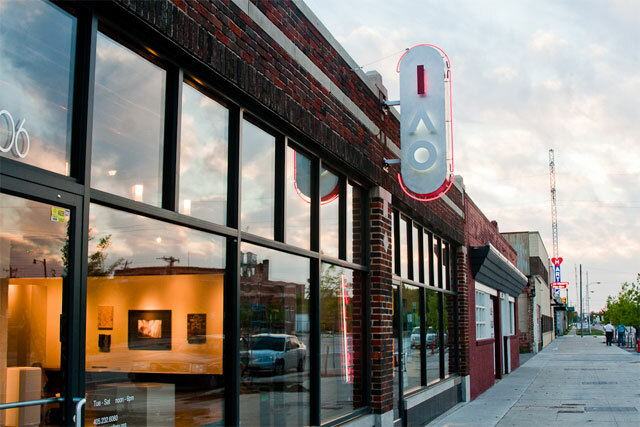 Now located at 706 W. Sheridan, just west of downtown, IAO maintains a robust schedule of programming including monthly exhibits, IdeaLab lecture series, Extreme Championship Poetry, Static film series and various other events, screenings and performances. …sustaining and encouraging emerging and established artists in all media who are intellectually and aesthetically provocative or experimental in subject matter or technique. As a truly grassroots organization IAO provides opportunities for anyone to become engaged in the initiation, organization and execution of the many diverse programs. Contact executive director Clint Stone at cstone@iaogallery.org to learn how you can get involved. The opening night of deadCENTER was one of the coolest events that I attended in the last year. Thousands of people sitting on a closed off street in downtown OKC watching a documentary set partly in Oklahoma was kind of awesome. That evening was followed up by dozens of screenings of independent films all over OKC. The name “deadCENTER” refers to the geographic location of the festival – in Oklahoma City – the “dead center” of the United States. And because we’re downtown Oklahoma City, essentially we’re in the dead center of everything! Founded in 2001, we envision a thriving, interactive global film community. We provide a competitive platform for independent filmmakers and a dynamic educational forum. Designed to inspire growth in the local film industry and energize visiting film professionals, the deadCENTER Film Festival will continue to encourage the film arts through screenings, discussions, competition, special events, panels, and focused programming.